Happy Halloween! It was a beautiful Halloween. It was 42 this morning, no ice on the truck, and the sun was out brightly. There were no clouds and just a wonderful day. Wonderful night for the kids to go trick or treating. MHCC was having a Halloween Carnival for the residents tonight and they were getting to go to various locations on campus and trick or treat and get the requisite candy. The kids were really looking forward to tonight. 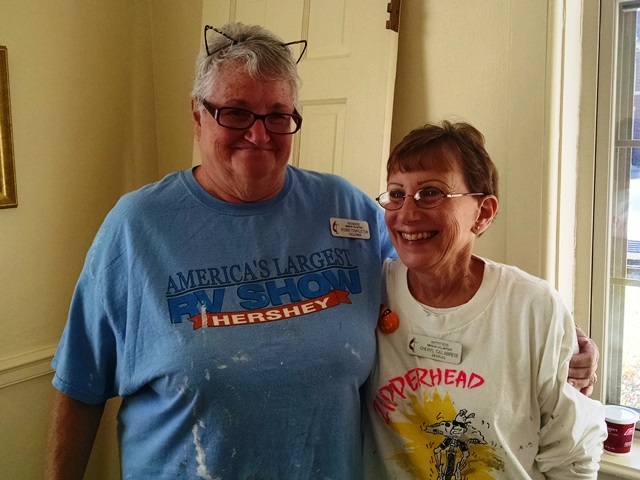 Bobbi and Cheryl were also excited about Halloween. They said they were wearing their costume to work today. They came as painters. Cheryl brought us a very moving devotion this morning using John 1 and Romans 9:35-37. She shared some of her life story and reminded us that many of the children at MHCC are chronically love starved and feel rejected, which is often the root cause to their bad behaviors and choices. Today the “barn crew”, Joyce, Tom and Evelyn, went back to work on the stable windows. Today they completed the windows on the south side and started on the north side. They have four more windows to complete. They are doing an awesome job. Cheryl worked at Noble painting the bathroom. It is a small half bath and only one person can work in there at a time. It looked so good when she completed the paining. Bobbi and Anne returned to James to complete the painting there. That work was completed by lunch. Ken and Don returned to Noble to start on the vinyl plank flooring. Max went between the barn and Noble helping where needed. After lunch, Anne worked on the flooring with Don and Ken while Cheryl and Bobbi returned to James to do some cleaning. We still think we are about on schedule to complete the barn and Noble. It was another full work day. Today we had lunch with the chief operating officer of MHCC, Diana Barber. We had never met her. She and the COO position is new, although through the years there have been COOs at various times. She told us that MHCC is licensed for 60 residents, 30 males, 30 females. They currently have 53 residents. Currently she is focusing on growing the transitional unit and getting an on campus GED program. Interesting in light of our morning devotion, Ms Barber told us that most of the kids here have never had their own bedroom before arriving here. Ms Barber was not familiar with NOMADS so had a lot of questions for us. We really appreciated her taking time to eat with us. After work we rested a while and then decided to ride our bikes again and rode through downtown and out towards the west. The stores were having trick or treating for the community kids and there was a crowd downtown. Everyone seemed to be having a good time. We rode on out the Silver Comet and then back to the campground riding about 10 miles. Another good day in Cedartown.